Willa: Last June our friend and frequent contributor Eleanor Bowman visited Forest Lawn Memorial Park, where Michael Jackson is interred. 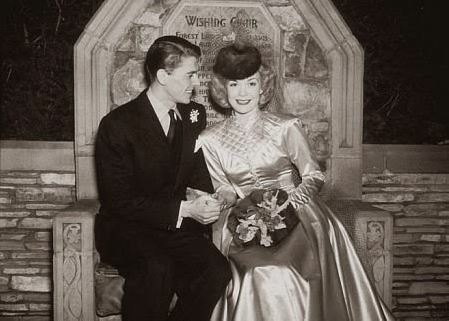 I had never thought much about it before – I guess I just assumed it was a nice cemetery where a lot of Hollywood stars were buried – but Eleanor explained that it was much more than that. 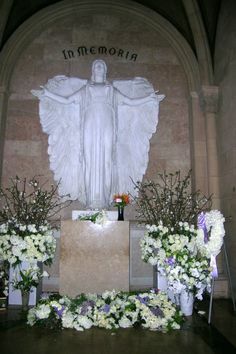 For example, she said the Great Mausoleum at Forest Lawn is filled with life-size reproductions of Michelangelo’s statues, carved in marble like the originals. 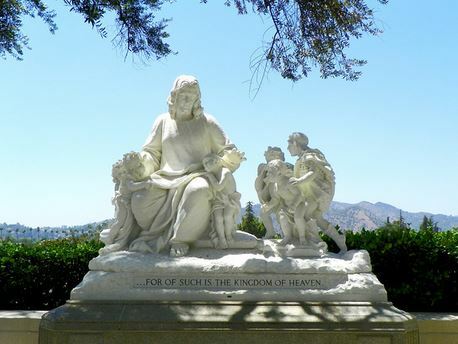 So this year, as we approach the seventh anniversary of Michael Jackson’s death, we would like to talk about Forest Lawn, about Dr. Eaton’s vision and how it relates to Michael Jackson’s ideas about art, and whether Forest Lawn is an appropriate final resting place for him. Eleanor, thank you so much for sharing your thoughts with us! Lisha: Wow, this sounds like a fascinating topic. I had no idea Forest Lawn had such an unusual history. Eleanor, thank you so much for joining us. I’m anxious to learn more. Eleanor: Hi, Willa and Lisha. And thanks for the invitation to again talk about my favorite person. Last year, I was visiting my son, Shaw, in LA and realized it was close to the anniversary of Michael’s death, and I wanted to do something, to somehow feel closer, to honor him. And my son, who a couple of years ago had humored me by driving me by the gates to the original Jackson compound on Hayvenhurst, entered into the spirit of things and spent the whole day taking me to places associated with Michael. Willa: Oh really? So you and your son took your own private Michael Jackson tour? Eleanor: Yes, we did. And it was a wonderful day! Willa: That sounds really fun! There are professional Michael Jackson tours costing hundreds of dollars, but doing your own tour sounds much better. Willa: I love that video, Lisha. And how wonderful that you were able to do some “DIY Michael Jackson tourism” with your son, Eleanor! Where all did you go? Eleanor: First we went to Holmby Hills (Holmby Hills is adjacent to Beverly Hills) to see the house he was living in when he was preparing for This Is It. It occupies an entire block, sitting on a steep, pie-shaped piece of land with the house at the top, backing up to the narrow end, and the front looking out over terraced gardens and beyond that over LA. The double garage opens right onto the street and the garage door was open, and I could imagine MJ coming and going from his house. The neighborhood is so beautiful and tranquil, curving narrow streets lined with lovely trees and flowering plants. So green and quiet. But the best and most moving part of the day for me was the visit to Forest Lawn. Very quiet. Rolling hills, mostly, with graves flush with the ground. Except, of course, for the huge mausoleum where the rich and famous, including MJ, are entombed – a sort of cathedral for the dead. Elizabeth Taylor’s crypt has beautiful sprays of white orchids on either side of a huge marble block with her name. On top was an enormous statue of an angel. Eleanor: The building is a real cultural experience. I have never seen anything like it. Copies of Michelangelo’s sculptures everywhere, as you mentioned, Willa. Full size. And a huge stained-glass window that is a copy of Leonardo da Vinci’s Last Supper. Really over the top, but still … fitting, I think, for these people who in some way represent our cultural archetypes. I told Shaw I was reminded of Evelyn Waugh’s The Loved One and Jessica Mitford’s The American Way of Death, both cultural critiques of the US, both inspired by Forest Lawn, and representing all I knew about Forest Lawn. I mean, Forest Lawn is a cultural icon all by itself, if a cemetery can be an icon. Lisha: Weddings? You can’t be serious! I can’t think of anything more antithetical to a cemetery than a wedding ceremony! Willa: I was shocked when I read that too, so I asked David Macdonald about it. The Forest Lawn company actually has six separate cemeteries – or memorial parks, as they call them – and Mr. Macdonald is in charge of the original Glendale facility, where Michael Jackson is. Toni Bowers and I visited California last November, and before our trip we contacted Mr. Macdonald. He very kindly took us on a tour, and while we were walking around I asked him if it was true that Ronald Reagan was married there. He said yes, that thousands of people have been married there, and it’s still a popular place for weddings. In fact, he said he himself was married there. I was really surprised by all the weddings. That wasn’t at all what I expected at a cemetery. Lisha: That is so cool you also got to visit! And that is just so surprising about the weddings – I just can’t picture it. Never in a million years would I have guessed that a cemetery church would become “the elite place” for a wedding! Eleanor: I wouldn’t either, Lisha, and I’m still not certain I’m comfortable with the idea. Willa: It’s certainly unexpected, isn’t it? But in a way it’s a testament to the success of Dr. Eaton’s vision. He didn’t think a cemetery should be a mournful place, but a place of celebration. In fact, Mr. Macdonald said that before Disneyland was built, Forest Lawn was the most popular tourist attraction in Los Angeles, and it still attracts a lot of visitors – though not nearly as many as Disneyland, of course. It’s just hard to imagine a cemetery being such a popular place to visit. Lisha: That’s really something. It sounds like Dr. Eaton really wanted to challenge the way people were accustomed to thinking about death. Lisha: I know the Père Lachaise cemetery in Paris also attracts lots of tourists, but I thought that was because of their famous “residents” like Jim Morrison, Oscar Wilde, Édith Piaf, and Frédéric Chopin. Visitors enjoy finding the graves of the historical figures who are buried there. Willa: And that’s true of Forest Lawn as well. It’s amazing how many famous people from many different spheres have been laid to rest there, including actors, musicians, athletes, and politicians. There’s Clark Gable and Carole Lombard, Humphrey Bogart and Lauren Bacall, Gracie Allen and George Burns, Mary Pickford, Ethel Waters, Sammy Davis Jr, Sam Cooke, Nat King Cole, Red Skelton, Casey Stengel – even Dr. Suess. Here’s a list of over 1,000 famous people buried there. Eleanor: Thanks, Willa. Pretty comprehensive. Willa: It’s a long list, isn’t it? But I think there’s something else at Forest Lawn that accounts for all the visitors and the wedding ceremonies. Dr. Eaton envisioned it as a place for the living as well as the dead. So Dr. Eaton actually envisioned Forest Lawn as a place for lovers! In that sense – that it’s a place where lovers stroll, artists sketch, and schoolchildren visit on field trips to see great works of art – it’s very different from most cemeteries. Lisha: That is such a radical concept – for the end of life to be celebrated as a new beginning, which is how we usually think of weddings, not funerals. It turns the concept of a burial into a celebration of life and love, rather than the ultimate tragic end. Willa: I think you’re right, Lisha. 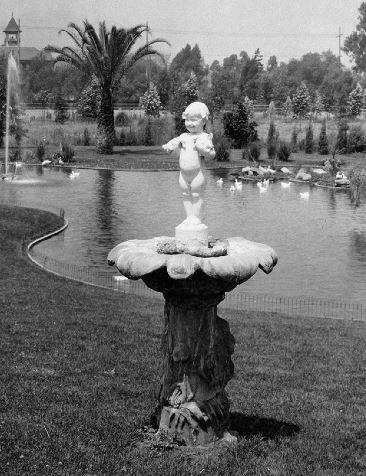 Lisha: The Forest Lawn website has an interesting story about the very first statue Dr. Eaton purchased for the cemetery, back in 1915, known as Duck Baby. The idea of placing art in a cemetery was so foreign at that time, the purchase created some controversy and was initially rejected by the company’s board of directors. Duck Baby depicts a smiling child, full of life, holding baby ducks in its arms. Installing a beautiful statue like this was such a different way of thinking about burials, many had a hard time envisioning the concept. Eleanor: Yes, it is very different. And not everyone has shared or admired Eaton’s vision. Especially not early on. Forest Lawn has had quite a history and has aroused a lot of controversy, often seen as an example of American commercialism and bad taste. Jessica Mitford used it as an example of what not to do. And Evelyn Waugh used it to satirize American life. 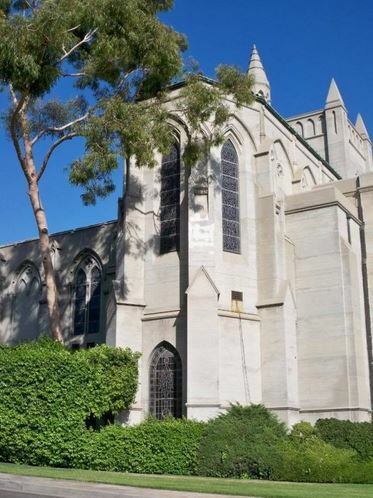 Since my only association with Forest Lawn was through those two books, I had some reservations, myself, about it as a proper burial place for Michael Jackson. But, of course, he isn’t really buried, but entombed. For one thing, it seemed almost sacrilegious to me for him to be entombed anywhere. He seemed to feel himself so much a part of nature, it seemed against everything he believed in to separate his body from his beloved Planet Earth. Cremation seemed more appropriate. It’s hard to believe the person who wrote those words would want his body to be kept separate from nature and the cycle of life – shut away inside a metal box which was then placed inside a stone box. But I also see how his family and fans would want a place to remember him and memorialize his life. Eleanor: Yes, I agree. On the one hand, he seemed to feel so in tune with nature, so much a part of it. I like to think of his art as an expression of nature, flowing through his body in his dance. His voice singing nature’s songs. However, I did a reality check and, although I think cremation would have been more suitable, he was, after all, Michael Jackson and that just wasn’t going to happen. So, on second thought, I decided that there couldn’t be any more appropriate place than Forest Lawn for the King of Pop. Willa: It’s interesting you should say that, Eleanor, because one of the things I learned at Forest Lawn is that an early definition of “mausoleum” is “a burial place for kings.” So it’s appropriate, as you say, that the King of Pop should be laid to rest there. Eleanor: I didn’t know that! So, really fitting for Michael. Willa: Yes it is. But Forest Lawn was also an early proponent of cremation. According to Forest Lawn: the First 100 Years, a book published to celebrate their centennial, “Facilities for a crematory were listed among Forest Lawn’s earliest goals in the articles of incorporation in 1906,” and they built a crematory in 1917, when cremation was a pretty unsettling idea for many people and not nearly as accepted as it is today. In fact, one of their many challenges in the early days was “dispelling myths” about cremation. But while they still offer cremation services, that isn’t what they are known for. They are known for the Great Mausoleum and the beautiful grounds, and the many celebrities who are buried or entombed there. Eleanor: Yes, and Forest Lawn is probably the only cemetery in the world that has the resources to protect him from crazed love and hate. The part of the mausoleum where he is is kept locked – which may also have something to do with his gold casket. I don’t know. Do either of you? I couldn’t get in when I visited, so had to content myself with imagining what it was like inside. So the Great Mausoleum is an enormous structure, or series of structures, and much of it is inaccessible to the public, though family members may visit whenever they wish. In fact, I believe all of the terraces are private. I’m not sure about that, but I think that’s right. I know Holly Terrace is closed to the public, and Michael Jackson’s family chose to place him there. According to an article in Time magazine published the day of his funeral, concerns about privacy were a major factor in their decision. Mr. Macdonald told us the Jackson family actually purchased the entire alcove where Michael Jackson is, which includes about a dozen additional tomb spaces in the walls surrounding his crypt. (Mr. Macdonald wasn’t sure of the exact number.) So I assume his mother will one day be laid to rest there, along with other family members as well. Lisha: That’s really interesting. I have never heard that before. The beautiful stained-glass windows surrounding his crypt are called the Ascension windows, and they are based on Nicola D’Ascenzo’s “The Ascension,” which is an elaborate window in the Church of the Good Shepherd in Scranton, Pennsylvania. The series of stone panels on both sides of the alcove are where additional caskets can be slid into the walls. Eleanor: Willa, thank you so much for including this picture. Willa: It’s beautiful, isn’t it? And notice all the flowers. While fans aren’t allowed inside Holly Terrace, Mr. Macdonald said they try to accommodate fans as much as possible. He said that, for security reasons, they can’t place anything by his crypt that is sent from outside Forest Lawn. But if fans purchase an arrangement from the Forest Lawn flower shop, so they know it’s safe, they will take it inside and place it by his casket. Fans from around the world regularly do that, he said, and there were a lot of flower arrangements when we were there. Eleanor: I wish I had known that last year. When we arrived, we headed over to the mausoleum and pressed a button outside the door, and a sepulchral disembodied voice from within told us it was closed, but then directed us to the door closest to Michael Jackson’s resting place. Willa: Yes, there’s an area near the main door to Holly Terrace that has become a perpetual memorial site. When we were there, there were fresh flowers and letters and hand-made posters, and that was in November, which isn’t really a special time in the Michael Jackson calendar – not like June or August. Eleanor: Yes. The terrace outside Holly Terrace has become a gathering place for people who have come to honor Michael. There were a few flowers near the door, and love notes. I went to buy some flowers from the onsite florist, and when I came back a few people were standing around talking quietly. I laid my spray down with the others, and then a very nice older man with an Australian accent spoke to me and said he would fill a vase with some water for my flowers so they would last longer in the hot sun. There was a feeling of such love – the love Michael Jackson gave to us in his art and his life we were giving to each other. It affected me really deeply, brought tears to my eyes. Willa: That sounds lovely, Eleanor. We didn’t see any fans while we were there, but some fans had been there earlier that morning, and Mr. Macdonald said fans visit pretty much every day. And I was deeply affected being there also – more than I expected. I have to say, I didn’t really feel Michael Jackson’s presence at Forest Lawn. I feel him much more strongly when I’m listening to his music, or watching his short films or concert footage. But it was very moving, and there are aspects of Forest Lawn that make it particularly suited to him, I think. Lisha: Wow, that is really beautiful! Willa: Yes, and I really like the story behind it. There’s also incredible stained glass. There’s the reproduction of Leonardo da Vinci’s Last Supper in stained glass, as you mentioned earlier, Eleanor, which took Italian artist Rosa Caselli Moretti seven years to create using da Vinci’s original sketches. And there are the Ascension windows in the Jackson alcove. There’s also a wonderful place called the Poet’s Corner on a lower level of the Great Mausoleum, where scenes from poetry have been recreated in stained glass. When Toni and I were there the sun was low in the sky and shining directly through those windows, and it just took our breath away. It was indescribably beautiful. Lisha: I would love to see that. It sounds absolutely gorgeous. Eleanor: Hmmm. Reminds me of Neverland. Lisha: That’s exactly what I was thinking! Willa: I think so too, especially the way they’re holding hands, with a puppy in a wagon. 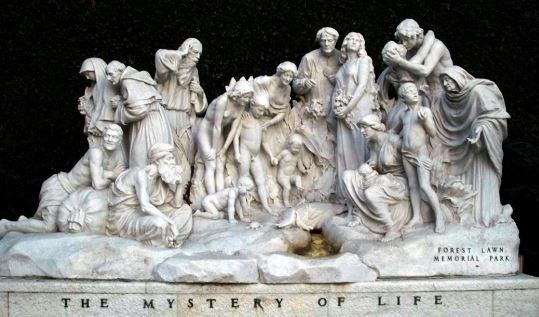 Statues like this are one reason I think Forest Lawn is very well suited to Michael Jackson. My gut instinct is that Michael Jackson would love this place. In many ways, it seems like the ideal resting place for someone who was so deeply committed to making the world a more peaceful place through beauty and art. Willa: I agree. It feels right that he should be in such a beautiful place filled with art. Eleanor: A perfect resting place for an artist, especially a pop artist. Forest Lawn in its early years was a symbol for what is now known as pop culture, but then the juxtaposition of “pop” and “culture” was seen as oxymoronic, if not moronic, reflecting the old British/European snobbery toward the US and its more democratic approach to art, an approach exemplified by American film and popular music. For so long, “culture” and art were identified with the old world, not the new, and with the elite, not the masses. Willa: Right, and Dr. Eaton wanted to bridge that divide and make “high” art – or at least duplications of high art – available to everyone, including schoolchildren. Eleanor: It is interesting that Forest Lawn and so many of the people who are buried or entombed there are so closely associated with film, an art form that has struggled to be taken seriously and recognized as art, just as popular music has. And that Forest Lawn came in for some of the same kind of criticism – like that dished out by Mitford and Waugh – that dogged Michael Jackson. Lisha: That’s kind of funny, actually! Eleanor: Yes, and Mitford’s analysis is probably not too far off the mark. I can’t imagine how much it costs to be laid to rest in the mausoleum. Willa: Yes, but admission is free. Anyone who wants to visit and walk the grounds and view the artwork is able to do that, free of charge. So in death, the wealthy pay to provide art and serenity to everyone. But I imagine you’re right, Eleanor – I imagine it’s very expensive to purchase a crypt in the mausoleum. Eleanor: Forest Lawn was viewed by Mitford as turning death into an industry, and film and pop music are also referred to as industries – or lumped in together as the entertainment business – or in LA, just “the business.” Certainly, success in these areas does bring fortune as well as fame. And Michael Jackson was often criticized for his focus on sales. Lisha: Oh, don’t even get me started on the old art/commerce binary! It’s really time to get past that. I’ve noticed it’s the same critics of commercialism who ignore all Michael Jackson albums except Thriller. As a culture, we’re really stuck in the idea that commercial success and artistry are at odds. It’s as if Michael Jackson is somehow “guilty” of having the best selling album of all time. Eleanor: I know, Lisha. So depressing. And so wrong! He equated sales not so much with money but as an indicator of how many people he was reaching – and changing – through his art. Willa: Exactly. I interpret this the exact same way, Eleanor. He was trying to change the world, and he needed a global audience to do that. Eleanor: Also, his commercial success reflected a level of cultural value not usually accorded to black men. So it was very important – especially to him. Lisha: I agree with you, Eleanor, and I think this can’t be stressed enough. There’s also the cultural idea that only the “original” work of art is of high value, while any duplicate copy, no matter how skillfully done, is a worthless replica devoid of any “real” artistic value. It seems to me that kind of thinking plays into the devaluation of recorded music, which is often assumed to be of lesser quality because it is factory duplicated and sold to the masses, rather than being reserved for cultural elites. Willa: That’s a really interesting connection, Lisha. Eleanor: And, when you think about it, why should art only appeal to the few, and not the many? Why should it be an acquired taste? 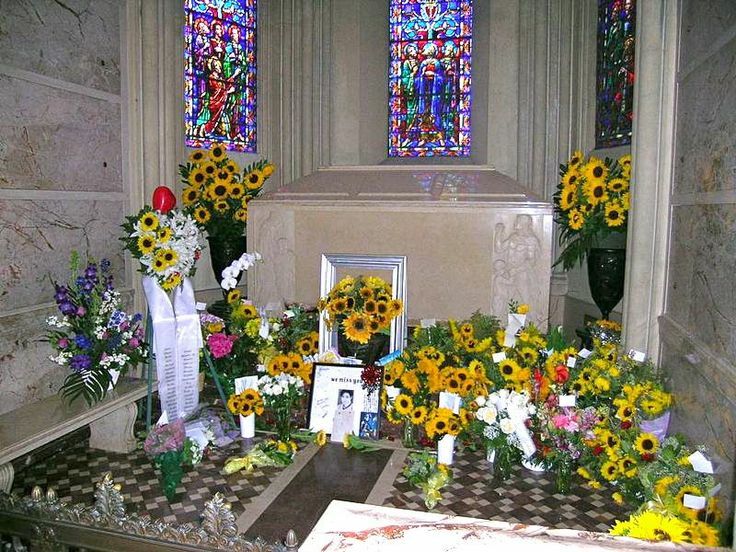 Forest Lawn, as a symbol of pop culture, is the perfect resting place for the King of Pop. Lisha: I would have to agree. Eleanor: Some critics have dismissed Forest Lawn as sort of a Disneyland for the Dead, but I think Michael Jackson would have seen that more positively, given his appreciation for pop culture and Disney. So maybe he would like the idea of being in a Disneyland for the Dead! Lisha: Hey! Isn’t that literally true? I mean, isn’t Walt Disney buried there? Willa: Yes, he is – or rather, there’s a private garden dedicated to him where his ashes were scattered. Here’s a link to a description and photos of his garden, which includes a Little Mermaid statue. Apparently, Walt Disney and Dr. Eaton were good friends, and Disney wanted to be a pallbearer at Dr. Eaton’s funeral but was too sick from lung cancer to attend. He was listed as an honorary pallbearer instead, and died three months later. His nephew, Charles Disney, was also a close friend of Dr. Eaton’s, and wrote a tribute to him after his death. Lisha: That’s wild. It’s a small world, isn’t it? I also read there is an wonderful art museum at Forest Lawn. An exhibit is on display there now through the end of the year that features the work of Eyvind Earle, one of Disney’s legendary animators. He is credited with conceiving some of the amazing background animation in Sleeping Beauty and Peter Pan. Willa: Wow, and what could be more appropriate than that, given Michael Jackson’s love of Disney and Peter Pan? Lisha: I agree. That’s an exhibit I would love to see, and I imagine Michael Jackson would have been quite interested as well. Eleanor: No doubt about it. Michael Jackson was fascinated by film, especially Disney, and oddly enough the hilly terrain where Forest Lawn is located was once used as a location for films. For example, Birth of a Nation was filmed there. Lisha: Whoa! Birth of a Nation was actually filmed there, before it became a cemetery? Eleanor: Yes! Can you believe it! Willa: Wow, I had no idea. That’s mind-boggling. Willa: That’s really chilling, isn’t it? It adds a whole new dimension to the significance of Forest Lawn as his final resting place. As Joe Vogel talked about in a post with us last year, Birth of a Nation was incredibly influential in shaping American ideas about film and about race – after all, it glorifies the Ku Klux Klan. And Joe sees Black or White as pushing back against that racist history. So how wonderful that people from around that world now come to that place – the very spot where Birth of a Nation was filmed – to pay tribute to Michael Jackson. What a reversal! That’s incredible. Lisha: You’re right, Willa, that really does turn the tables, doesn’t it? That’s a wonderful way of thinking about this. As you pointed out earlier, visitors show up almost every day to pay their respects to Michael Jackson, as one of the most famous and distinguished artists of our time. That’s a far cry from the racially segregated future that Birth of a Nation imagines. It is so strange to think that film was widely applauded and accepted in its own time. Eleanor: Yes, really strange. Also, in a related vein, in its early years Forest Lawn was segregated – closed to African Americans, along with Chinese and Jews. Willa: That’s another important point, Eleanor. And now their most famous “resident” is Michael Jackson, attracting people from around the world. So again, it’s like an act of reclamation. You know, in the beginning Forest Lawn was pretty exclusionary in their art also. The emphasis of their collection was definitely on white European art and traditions, especially the Italian Renaissance, with Dr. Eaton visiting Europe again and again in pursuit of art for Forest Lawn. Lisha: That’s amazing! I had no idea. Eleanor: Wow. A sacred place. I love it. Well, it is sacred to me because Michael’s tomb is there. But I like the idea that the Dalai Lama sees it as sacred, too. Willa: I do too. Well, thanks so much, Eleanor, for making me aware of what a special place Forest Lawn is, and encouraging me to visit! Lisha: And thanks for joining us today to talk about it. I learned so much from you both. Eleanor: Thanks again for inviting me.